Following the general reconnaissance focus of the 2007 FOMS field trip, it was time for FOMS members to roll up the sleeves and do a little work in the June 2008 trip. Eight members participated (Colin Harris and Elaine Smyth, Bruce and Sherrie Gotch, Travis Gotch, Lois Litchfield, Ann Callis and Simon Lewis pictured by Simon below). It was a pleasure to meet new members Lois and Ann and to learn a little about their respective life-times of experiences in the Far North. We were also joined for a day or so through the week by Kelli-Jo Kovac and Tash Bevan from BHP Billiton and new DEH Regional Ecologist Alex Clarke. Following a mid-afternoon rendezvous at Roxby Downs on Saturday 21 June, we convoyed up the Borefield Road to a camp-site on the Gregory (same site as last year). On Sunday we moved on to Elizabeth Springs, in Wabma Kadarbu Mound Springs Conservation Park, where we donned gloves and collected rubbish at an old musterers’ camp. Then on to a camp-site in the dunes near Strangways Springs. On Monday 23 and Tuesday morning we were joined by Kelli-Jo and Tash as Travis took charge of a survey of those springs at Strangways that still support wetland vegetation. In all we covered some 80 or 90 spring vents, leaving only a few for Travis to finish off at a later date. structing a vehicle barrier at the Peake Repeater Station at Freeling Springs. Travis somewhat bravely towed the trailer (with no spare tyre) up to the old Peake, losing only a few sleepers along the way and also managing to puncture a tyre. cision sleeper cutting while Sherrie and Travis excelled in the synchronised crow-bar event. 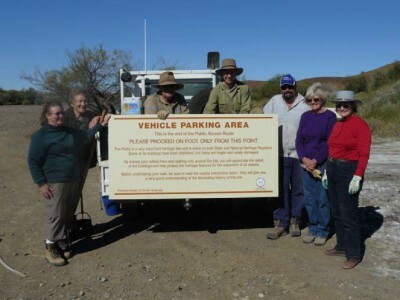 We also erected a sign organised by the Pastoral Branch of DWLBC. Alex Clarke showed impeccable timing, arriving just as we finished the job. There are other concerns at the old Peake regarding uncontrolled vehicle access and camping and we spent some time looking at a strategy to address this. This will be the subject of further discussion with the pastoral lessees, DWLBC and others. Friday 27 June was our last full day in the field and we had a more relaxed time looking at a number of springs, including Hawker, Levi, Milne, Outside, Twelve Mile and the Fountain. The changes at Twelve Mile, particularly with proliferation of Phragmites, were quite remarkable. A final camp on George’s Creek near Old Umbum and we then headed for home. A highly successful week, a very companionable group and fantastic weather. Many thanks to all concerned. The ecosystems associated with the GAB mound springs are of considerable biological significance, containing numerous plant and animal species, the vast majority of which are endemic (only found in a single environment), with very restricted distributions. The best-studied fauna of the springs are the hydrobiid snails, of which 23 species are described so far. Other endemic aquatic fauna include crustaceans such as isopods, amphipods and ostracods, a number of fish and less well-known invertebrates such as flatworms and mites. Some of these critters are relatively easy to see, others less so, and they require a microscope to identify them. Many people who have visited springs such as Blanche Cup or the Bubbler will have noticed things which look somewhat like garden slaters crawling around in the outlets of these springs. 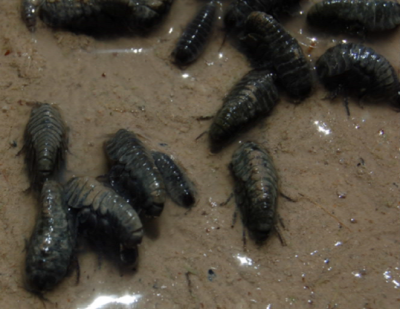 These are isopods known as Phreatomerus latipes and are a very unsual species endemic to the Lake Eyre Springs. However next time you visit the springs take the time to sit for a minute and see what other life they are supporting. Sometimes something that looks like sand or dirt, can actually contain a writhing mass of life The black dots in the photo below are not grains of sand or dirt, but actually a tiny crustacean known as Ngarawa dirge. There are millions of them!! Despite the listing of the springs as a “threatened ecological community”, there is relatively little known about their biology and ecology. The majority of research undertaken on the springs has focused on specific aquatic groups such as the snails. Knowledge of the aquatic fauna is particularly important due to the reduction in artesian pressure, which places these communities at direct risk of extinction. 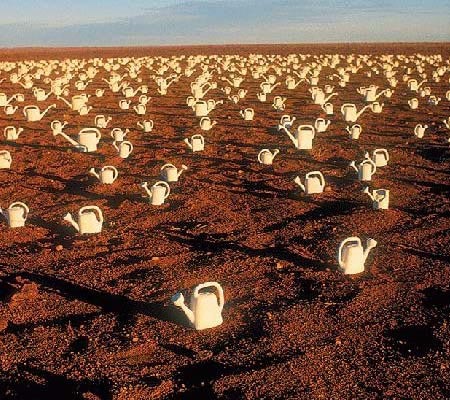 The nature of the mound springs environment means that individual springs are essentially “islands in a sea of desert”. 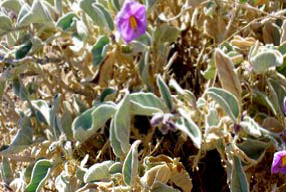 Whilst this isolation has ensured that the mound spring animals and plants are particularly unique, it also means that spring communities are more susceptible to extinction from springs drying out or becoming uninhabitable as dispersal by plants and animals between springs is difficult. A research team consisting of members of the University of Adelaide and The South Australian Museum, is currently undertaking research in the mound springs. The main goal of this research is to examine the biodiversity and evolution of the unique faun of these springs. The primary tool for our research is molecular genetic data. By examining the genetic data of these animals, we can examine many questions, for example; How many species are there? How long have the species existed in the springs? How easily animals disperse between springs? We are also interested in studying the ecological communities within the springs, this will help us to address questions such as; Do all the springs contain a similar collection of fauna? Are there springs with ecological communities which are unique compared with other springs? By attempting to answer these questions we will gain a greater insight into the biological environment of the mound springs. 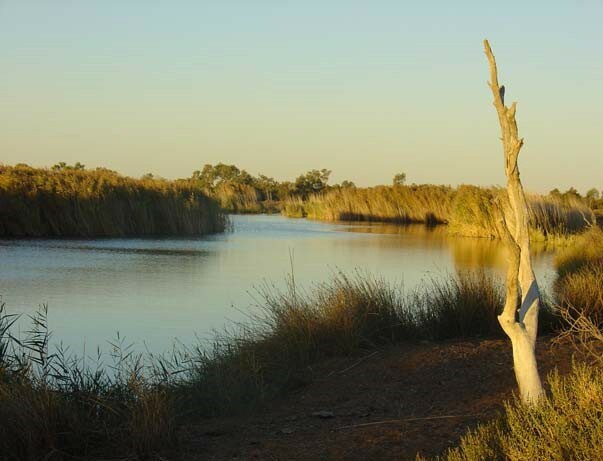 This will provide a means for management bodies to incorporate significant biological information into their decision making and help facilitate the conservation of mound springs communities in the Lake Eyre region. The very first task that we have to undertake is an assessment of the number of species supported by the mound springs and the distribution of the species. This may seem like a straightforward task, and something that should perhaps already be known for these springs; however there are a number of complicating factors. Firstly we have to define a species; which is essentially something that interbreeds successfully to produce living offspring. In order for a species to survive it must be able to adapt to factors such as available habitat, food sources, temperature, and predation (this is known as a species niche). Because of the restricted island-like nature of the springs, the spring animals must adapt to the environment to survive as they cannot simply move to another more favourable environment. The environment of the springs is mainly governed by a very steady source of groundwater from the Great Artesian Basin. This water is quite constant in its composition and does not alter significantly over time or geographic distance and it flows into a relatively stable and essentially arid environment with very little input of surface water. Therefore despite many of the springs appearing to be quite different in appearance, the underlying environment across these springs is very similar (particularly across similar geographic regions; for example the Dalhousie springs are all quite similar). One consequence of this environmental similarity is that many of the springs appear to contain the same groups of animals. 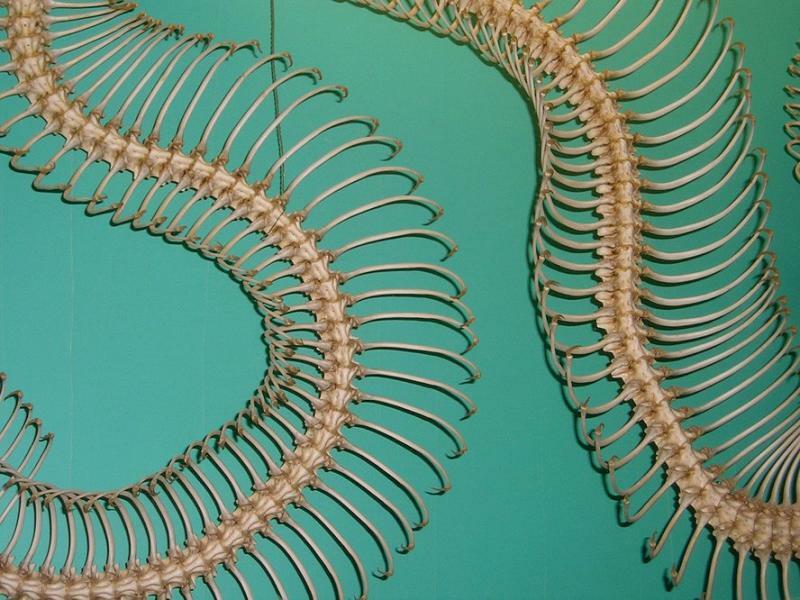 Another consequence is that animals that fill the same niche in different springs (i.e use the same habitat, eat the same food, avoid the same predators) will have evolved in a similar way to fill this niche, and can therefore have evolved to have very similar features. A good example of this in the mound springs is the amphipods. Amphipods are small, shrimp-like crustaceans, found in marine, freshwater and terrestrial,environments. Within the springs, there is generally a single type of amphipod found. It is quite small, generally less the 5mm long and difficult to see with the naked eye. 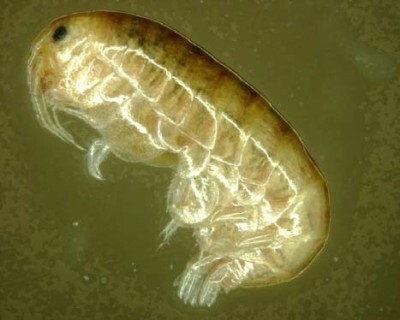 however, when amphipods are present they are generally present in their hundreds Given that this amphipod is found in numerous springs, seemingly inhabiting the same environmental niche, it has been generally thought that it was a single species. However, how do we investigate this? Traditionally, we would use morphological (ie what they look like) differences and similarities to identify new species and estimate how closely related they are. If we cannot tell them apart we need to examine their genetic code and measure the differences by this means. The use of genetic methods to do this is a relatively straightforward process. By examining the genetic code of two organisms we can determine how closely they are related. When examining more than three or more species we can use a branching diagram known as a phylogenetic tree to illustrate relationships, knowing that two species which share a common branch are more closely related to each other. The differences between species are known as mutations in the genetic code. Because these mutations occur at a steady rate we can also determine the amount of time that has passed since two species evolved. By determining the amount of genetic change we can see how many species of amphipods there are and also can trace their ancestry back and determine how long these species have existed in the mound spring environment. So far, we have examined many of the amphipods from the Lake Eyre, Dalhousie and some of the Springsure springs in QLD. The amphipods in QLD and Dalhousie Springs are quite unrelated from each other, and from those at the Lake Eyre Springs. This is to be expected as these groups of springs are very geographically separate from each other and for them to contain a single species these amphipods would have to be able to travel over a lot of inhospitable country in order to interbreed. The most interesting finding so far is that within the Lake Eyre Springs there are at least 10 new species of amphipod. Some of these are very similar to each other and some are incredibly different to each other (as different as humans and rats). Despite these enormous genetic differences and large increase in the number of amphipod species, these amphipods still look practically identical. Therefore, in biology they are referred to as a cryptic species complex. A cryptic species complex is a group of species which satisfy the biological definition of species, that is, they do not interbreed with each other, but they are not morphologically distinguishable. Currently we are only in the early stages of our research and have only examined one group (the amphipods) from a relatively small (around 20) number of springs. Given that there are many other springs to examine, we expect to find many more “cryptic species” of amphipods. We also plan to examine the genetic relationships of many of the other invertebrates within the springs and expect that they too are likely to consist of numerous cryptic species. The impact of this is that the number of different species supported by the mound springs will increase greatly, significantly increasing the importance of conserving these beautiful, unique ecosystems. Finally, one of the more important questions that we wish to examine is ; Where did all of these unique species come from? The DNA evidence so far suggests that many of the species we have found have existed for around five to ten million years, since the geological time period known as the Miocene. Environmental conditions in inland central Australia, particularly around Lake Eyre, in the Miocene era were considerably wetter than today, with giant freshwater lakes and wetlands supporting species such as crocodiles and flamingos as well as many freshwater critters such as snails, amphipods and isopods. At the end of the Miocene period central Australia began to dry out to become the environment that we see today. Since this time the mound springs have represented the only permanent source of water within which aquatic animals and plant scould survive. Obviously they are not large enough to continually support large animals such as crocodiles and flamingos for the last 5 million years; however they could have definitely provided a refuge for the smaller fauna we find today. The geological evidence that might show that the springs have been around since wetter times has long since eroded away in the harsh desert conditions, however we may be able to use the DNA of the spring animals to enhance the scientific evidence that these springs represent living “time capsules”. Written and photos by Nick Murphy, School of Earth and Environmental Science. The University of Adelaide.